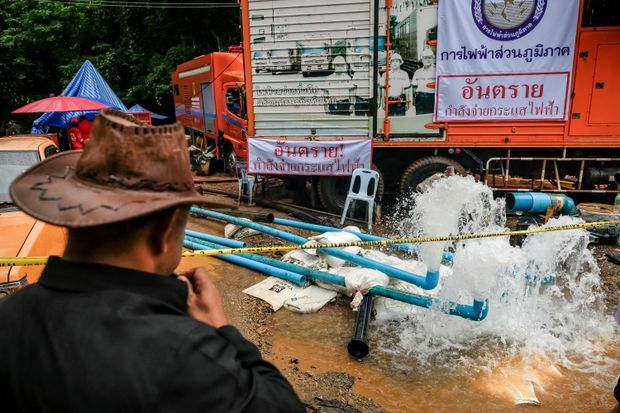 Machines pump water out of a cave where 12 boys and their soccer coach have been found alive where they've been trapped for over a week on July 3, 2018 in Chiang Rai, Thailand. Seven members of a Thai navy SEALs unit, including a medic and a counsellor, were staying with the group after its dramatic discovery on an elevated rock late on Monday by divers who had struggled for hours through narrow passages and murky waters. News of the survival of the “Wild Boar” team sparked jubilation in a country gripped by the harrowing drama, with news websites, social media and the Prime Minister celebrating the event and hailing the rescuers as heroes. network stretches 10km into mountain. A video shot by the rescuers in flickering torchlight four kilometres from the mouth of the cave in Thailand’s northernmost province showed boys clad in shorts and red and blue shirts sitting or standing on the rock above an expanse of water. Aged between 11 and 16, the boys and their 25-year-old coach went missing on June 23 after they set out to explore the caves in a forest park following a training session. Officials declined to say what plans “A” and “B” were, but said they aimed to bring the boys out the same way they had entered. Options include teaching the group to use smaller diving apparatus and guiding them out of the caves, from which 120 million litres of water had been pumped continuously for 75 hours by Tuesday evening. Their search targeted an elevated mound they believed could have provided a refuge, but that was already flooded, so they went 400 metres further, and found the team. “Found the 13 ‘Wild Boars,’ safe and preparing to come out,” was the headline in the country’s biggest daily, Thai Rath. “Take our hearts – thank you,” read one cartoon, while another read “You are our heroes,” followed by “Thank you” in eight languages. His deputy, Passakorn Bunyalak, dismissed rumours that the mission could last up to four months, but said the boys’ safety was paramount and their extraction should not be rushed. SEALs commander Rear Adm. Apakorn said the flow of a cave stream had slowed and water once at head level was now at shin level. He said the boys were in relatively good condition.